This is GONE for 2018 - What changes are YOU making? The new year always brings conversation of change, right? Do you welcome it or do hate the idea? The idea of things being different. I’ve had mixed feelings about change throughout my life. I’ve been frustrated by it, preferring that everything be just as it is and I’ve also welcomed it with open arms, no longer satisfied with the same. Whenever I’ve not enjoyed change, there’s been a root of fear attached to my outward expression. Fear of disappointment or of disappointing. Because despite being called and chosen by the King of kings and Lord of lords, we can still find ourselves afraid from time to time. Now of course, NOT allowing fear to rule us needs to be an everyday thing. After all, small steps lead to big results eventually. However, sometimes, we just KNOW that big steps are what are needed to create the change we REALLY want to see… The changes we’ve been called to and are yet hiding from. 1. I’m closing down my 1:1 coaching program. Through my courses, group programs and mini programs during 2017, I served over 60 women! I only just counted that number and feel SO humbled and grateful to have worked with so many incredible women this year. I’ve learned so much about how I want to show up and the way in which I want to serve women moving forward and while I FULLY believe in the power of 1:1 coaching (and can recommend some great ones if that’s the support you’re after), I’m being called to do something different now and although it’s scary, I’m fully embracing the change. Being a High School teacher for 7 years before building my business from scratch means that groups just seem to make SENSE to me. Classrooms, sisterhoods, community - They’re where I’ve spent most of my life and they’re where I love to hang out and so it’s only natural that it would eventually come to that point for my business too. I’m also a passionate creative at heart (hello a season of spoken word poetry and a handbag of journals full of hopes, dreams and prayers under my bed) and creating content which teaches, inspires, motivates and supports you to be all that God’s called you to be sets my soul on fire! But this isn’t REALLY about me to be honest. It’s about YOU. This business started with me following the call on my life 15 months ago and not looking back. That’s the same way my blog started almost 7 years ago, and the same way me recording videos and posting them on YouTube (before live stream was a thing) started a couple of years after that. One thing I know is that when God calls, I should listen. And so I’m listening to this and making a leap from the part of my business which has brought me the most income in 2017 and following the Holy Spirit’s leading. I never say never and so who knows, I MAY coach women 1:1 again someday but I know that for at least the time being, that option is off the table for me as I make space for what’s next in my business. 2. Building Beyond The Building is the program where you’ll get MOST access to me. Removing my 1:1 program doesn’t have much to do with me needing or wanting to automate things and step away from my business. It’s literally about what I’ve just explained – impact and how I can make more of it for the Kingdom. Most of you will have heard by now that my 6-month group coaching and mastermind program Building Beyond The Building starts January 8th with our intention setting orientation call happening live next week. Doors to the first round of this program close tomorrow (Saturday January 30th) at midnight pacific time. Doors to this program will most likely open at some point in 2018 (but not at the current round one price point) and will then open once a year as my LIVE group program which the women in it will get access to me daily in our private sisterhood for feedback & support, weekly live teaching and coaching calls for 6 months + a live in person event and lifetime access to the content and any updates made on it. Anyone who’s been in my programs or courses this year will know that I am NOT a coach who hosts the weekly training and then is silent until the next one, instead my eyes and ears are on everything and so when you invest in BBTB, that’s the sort of support you can continue to expect. 3. I’m OWNING business strategy AND Biblical teaching on the same platform. Some of you might recall that I started my business with the launch of two devotional e-books in September 2016 followed by the launch of my first ever e-course in December 2016. This was typical of me starting with what I know – Biblical principles which mobilise people for their REAL LIVES. I’ve done this for over 10 years as a women’s ministry leader, Bible teacher and church youth worker. My e-course, Chosen, had over 30 women go through it live when we started off in January 2017 and to this day I have women telling me about how the content changed their perspective on things. After running my online business for 7 months, I was ready to share all I knew about strategy and the HOW and decided to put it into a program. In March 2017 I launched my business foundations program ‘Clarity Class’ which, in the words of one of the women who went through it live, will mean you have a business by the end of it if you follow each module. This program has some foundations and roots in the Bible when it comes to the mindset work etc (because I can’t help it!) but the reason I chose not to continually run it live like I will with BBTB is because after going through both Chosen and Clarity Class live, I knew that I wanted to focus on practical strategy AND Biblical principles with my signature program. I’m ALSO going to be running monthly workshops for the first 6 months of 2017. There will be two a month – one will focus on us activating the WORD OF GOD for your life (whether your life is one as a business owner OR you’re in a 9-5, you’re a stay at home mum or a mixture of it all!) and the other will focus on business STRATEGY (creating a membership site, maximising your message online etc.) Each will have a live video training + Q & A with me) and a workbook. Details on exactly what these workshops will entail how you can access them will also be available January 3rd 2018. 4. I’m bringing blogging back. I started out in the online space as a blogger almost 7 years ago. I LOVE writing and it’s a way in which I know God is calling me to give to you for free. I’ve so been enjoying bringing blogging back at the end of 2017 and I can confirm it’s here to stay for 2018 too. I’ll be sharing business tips and advice as well as Biblical truth – all with the aim to support and mobilise you to live your best life, just like I do with my programs and workshops. There will also be lots more free content in the form of audios, videos and more coming your way for 2018 too! If you’ve read this far, thank you! 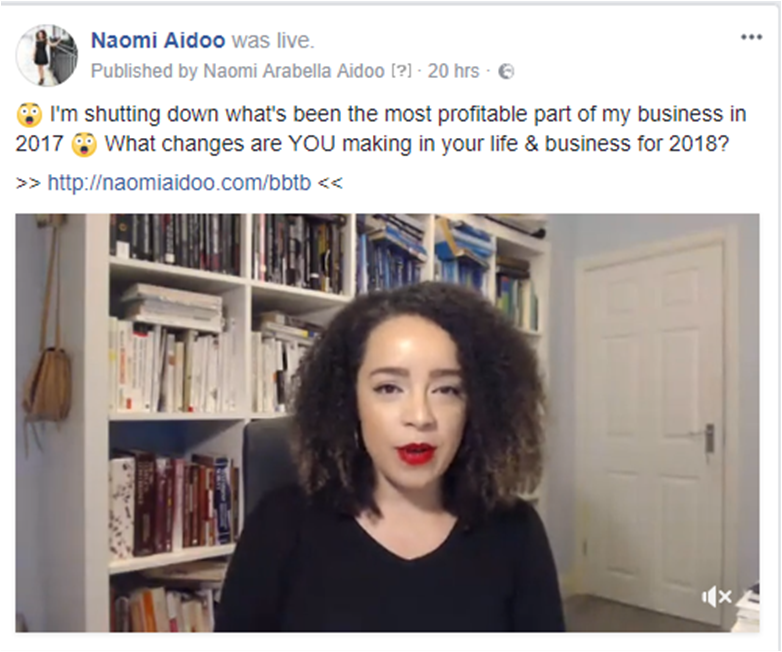 I appreciate you taking the time to learn a little more about the changes taking place in my business for 2018 and how they might affect you. I hope this posts inspires you to make changes even when they feel scary, trusting in God who’s perfect love casts out all fear. If you’ve been waiting to work with me 1:1 and are a little disappointed that that won’t be an option for the foreseeable future, or if you’ve been on the fence but haven’t taken the leap yet, I’d strongly urge you to come and join Building Beyond The Building before the doors close tomorrow. It’s currently at the lowest price point it will ever be at AND it’s the place where I’ll be giving you most 1:1 support moving into 2018. Not to mention that this will be the ONLY time you get all of my other content as an additional bonus when you join.